The purpose of the applet below is to illustrate a mathematical fact that plays an important role in the Game Theory, Economics, and general optimization problems. I postpone the statement until later. See if, with the help of the applet, you can arrive at the right formulation yourself. 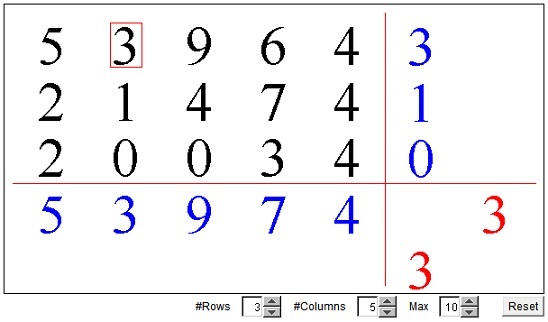 Given a rectangular array of numbers. In every column, select the maximum value and write it under the column. Similarly, in every row, select the minimum value and write it to the right of the column. In the applet, these computed values appear in blue. In this fashion, our original array of numbers is augmented with one (blue) row and one (blue) column. In the blue row select the minimum element and write it (in red) to the right of the row. Similarly, in the blue column select the maximum number and right it under that column. Compare the two (red) numbers. Is there any regularity? Most of the time the numbers will be different. Sometimes they will coincide. On such occasions, the applet will provide an additional clue. Try to grasp its significance. To get a different configuration, press the Reset button. With larger matrix dimensions, it may be come tiresome to keep pressing the Reset in the hope of getting a matrix with a saddle point. However, each of the numbers in the matrix can be changed individualy. Click or drag the mouse off the vertical center line of each entry. The number will go down or up, depending on whether the cursor is to the left or right of the central line.